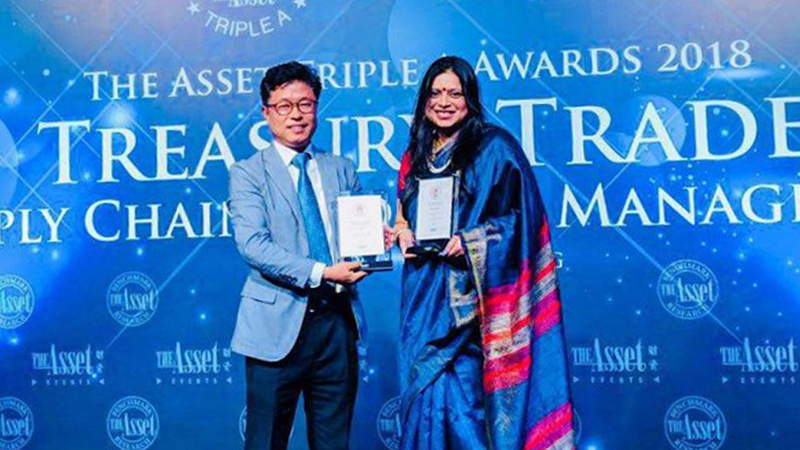 On April 30th, POSCO Maharashtra received ‘The Best Supply Chain Solution’ Award at ‘Triple A Awards 2018’ hosted by the Asset, a global financial magazine. Triple A Awards nominates multiple institutions that showed remarkable financial achievements in Asia. On April 30th , POSCO Maharashtra received ‘The Best Supply Chain Solution’ Award from The Asset in Hong Kong. From left, Goo-yeong Ahn, head of the management support department, and Rupa Balsekar, CEO of BNP Paribas. POSCO Maharashtra received the award in recognition of its supply chain financial solution that perfectly managed the financial liquidity and provided efficient transactions with surrounding suppliers such as POCO DAEWOO, the main material supplier in India. They are the only Indian company to receive the prize at Triple A Awards 2018 in the ‘Industrial Solutions’ section. Credit exposure with high credit rating company such as the manufacturing company enables to increase the credit limit and lower the interests. This can bring huge advantages of cost saving and improvement of financial structure. Also it is beneficial to manufacturing company in terms of cost saving. POSCO Maharashtra is the first POSCO’s subsidiary that applied the method. POSCO expects that the success of POSCO Maharashtra will give positive inspiration to other overseas subsidiaries and other global companies.